The same care and identification process developed for humans is an intricate part of our private cremation service. 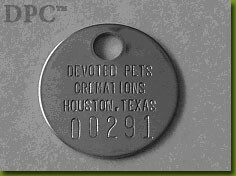 Every pet having a private cremation service is tagged at the place of death with a numbered stainless steel identification tag. This ID tag can withstand temperatures exceeding 2800 degrees and will remain on the pet during the entire cremation process. The cremated remains will be returned to the pet owner or veterinary professional with the metal ID tag attached assuring positive identification. Please contact us for additional information concerning cremations. Copyright © 2008 Devoted Pets Cremations and Memorials ™ All rights reserved.